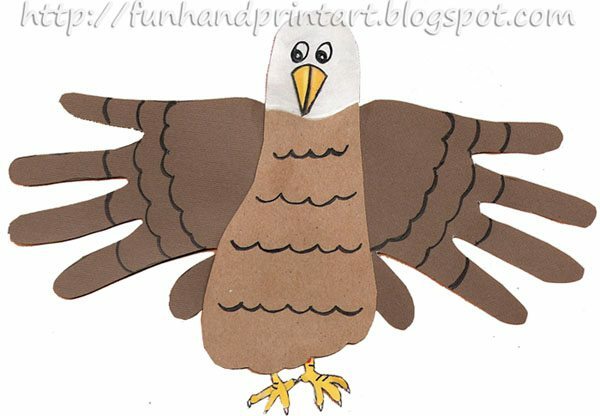 I made this handprint and footprint eagle craft with my son in honor of Independence Day. It makes a simple, mess-free activity that can easily be done with a group of kids. 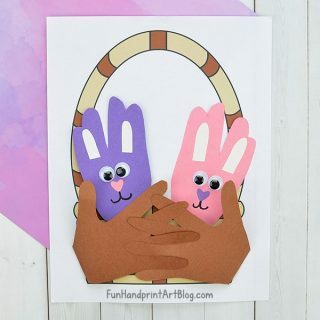 Start by tracing both hands on a brown sheet of construction paper. Trace one foot on a sheet of construction paper in a different shade of brown. Cut around all 3 traced pieces. Paint the heel of the foot with white to create the head (or use the free printable mentioned below). Glue the hands to the backside of the foot to create wings. 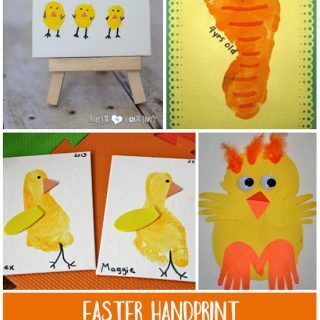 Head over to Free Kids Crafts to print the eyes, beak, and feet. I chose to draw eyes on instead. Looking for more 4th of July Crafts? Head over to our Patriotic Kids Craft board on Pinterest for tons of star spangled fun like this handprint and footprint eagle craft! What a cute eagle!! Stopping by from SITS. Amanda, can you do this on a shirt? Okay, that’s a dumb question, of course you can do it on a shirt! But what kinda paint would be best to use? Love the eagle!